Makes light work of everyday gardening jobs. Perfect for any gardener, makes light work of all your everyday garden jobs. Ideal for working between plants in vegetable and flower beds. Traditional wooden handle, shaped for a comfortable grip. Strong, carbon steel prongs with good resistance to wear. 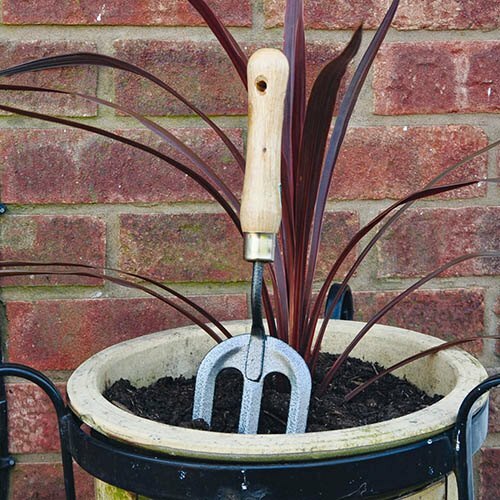 Perfect for any gardener, our carbon steel hand fork makes light work of all your everyday garden jobs. Ideal for vegetable beds, raised planters and small flower beds, use it for working and weeding between plants as well as forking over topsoil to open it up. With a traditional wooden handle, shaped for a comfortable grip, it's also a nice addition to your gardening kit. The fork prongs are made from durable carbon steel, making them strong with good resistance to wear, so it'll cope well with regular use. 1 x hand fork, 30cm long.